Last Saturday, a series of small rallies took place in our state capitals protesting the recently approved dredging and dumping project at Abbot Point. The event was organised at the last minute by ASEN, the Australian Student Environment Network and got a pretty good turnout considering the lack of promotion. Senator Lee Rhiannon kicked off the rally with a passionate speech, reaffirming why the reef is so important both nationally and internationally. She spoke of the environmental vandalism being committed by the Abbott government and criticised Environment Minister Greg Hunt for making a mockery of his title. Unfortunately, the issue at hand was diluted by subsequent speakers who had their own agendas including coal dependence, climate change, mining blockades and anti-Abbott sentiment. While these are certainly all issues that many care about, and are intrinsically linked to the Abbot Point dredging project, the message about saving the reef from this immediate threat was lost completely. Once the march started, the event was completely hijacked by the Socialist Alliance. With a big red banner at the front of the march, accompanied by a sea of red flags behind, one would easily mistake the rally for a socialist protest. Again, the original message was lost and would have had little impact on any passers by. While I certainly do not support the current government, the reef issue is important to many Australians regardless of political belief. I personally know many Liberal voters who are passionate about protecting the reef – it is something that transcends politics. 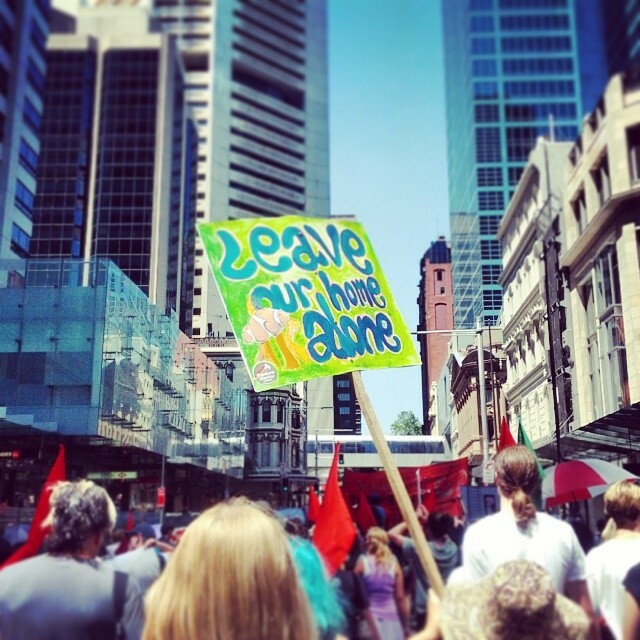 F*ck Abbott chants and Socialist banners play right into the hands of those who dismiss environmentalists as tree hugging hippies or far left extremists. If we continue to alienate the moderate right in this way, the reef will lose.